When a law enforcement officer suspects that a driver may be intoxicated, the officer conducts a standardized field sobriety test on the driver. Field sobriety tests require the driver to perform a number of skills tests that assess any impairment due to the influence of drugs or alcohol. Standardized field sobriety tests include the one-leg stand, the walk-and-turn, and the horizontal gaze nystagmus test. In the one-leg stand, the driver raises one foot and tips the head backwards slightly. In the walk-and-turn test the driver must walk a straight line, heel to toe. In the ‘horizontal gaze nystagmus’ test, the officer moves a penlight past the driver’s eyes. The officer is trained to look for certain movements in the eyes at a 45-degree angle, a test which is fairly accurate for determining drug or alcohol intoxication. The officer may then read an implied consent notice and may ask that the driver consent to some form of chemical testing for intoxication. Roadside this is usually a breath test, but the officer also has the right to ask the driver to go to a medical or detention facility to take a blood or urine test. A driver may be determined to be ‘per se intoxicated’ if a blood-alcohol concentration (BAC) determination is above a set limit. 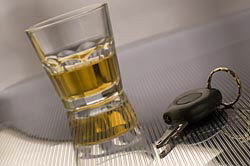 The driver may still be arrested and convicted for DUI with a .06 percent BAC level if the arresting officer testifies that he observed the vehicle being driven in an unsafe manner or that the driver exhibited both slurred speech and/or severe inattention during questioning. All states have ‘zero tolerance’ laws. Their purpose is to target drivers under the legal drinking age. If the under 21 driver has any trace of alcohol in her or his system (a BAC above 0.0), or with negligible BAC levels such as .01 or .02, and is operating a vehicle, more severe penalties apply than those imposed on drivers over 21. • the driver was under the legal drinking age at the time of the DUI violation. An increasingly popular penalty, usually only imposed on repeat offenders, is installation of an ‘ignition interlock device’ on the driver’s car. This device measures the operator’s BAC through a breath test. The vehicle will not start if more than a BAC level of .02 percent is measured. The driver pays the cost of rental, installation, and maintenance on the device.